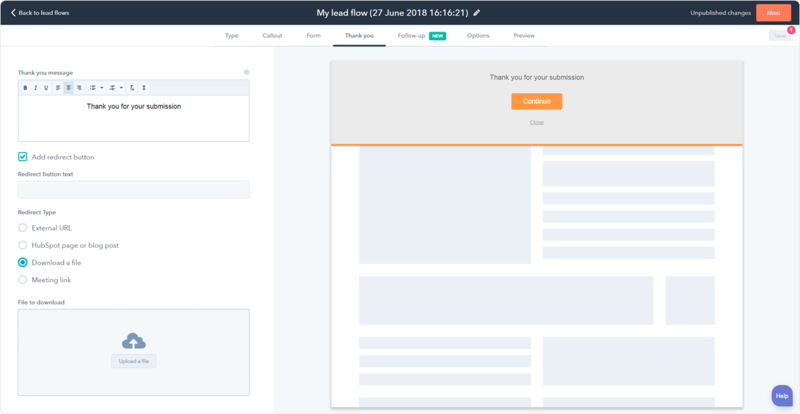 From the ‘Thank you’ step of the lead flow wizard, you can now add a redirect button onto any lead flow. Lead flows are a quick and easy way to collect contact information from your site visitors. But once someone converts on a lead flow, you need to establish a clear next step for those leads. Whether it’s sending them to a new page, giving them the option to download a file, or having them book time with your sales team, the new redirect button provides clarity to your newly converted leads, and lets you nurture these individuals from site visitors into loyal customers. This update also resolves a highly requested feature on our ideas forum. Within the lead flows tool, go to the thank you tab in the lead flow editor. Below the thank you message text box, you’ll now see the option to add a redirect button. Once selected, you’ll be able to edit the text of the button, and determine which type of redirect you’ll provide your leads with. You can redirect them to another page (either external or HubSpot hosted), provide them with a file to download, or insert one of your meetings links. This is available to all users of HubSpot's marketing tools.